Increased spasms in spinal cord injury (SCI) patients, whose spasticity was previously well controlled with intrathecal baclofen therapy, are due to (in order of frequency) drug tolerance, increased stimulus, low reservoir volume, catheter malfunction, disease progression, human error, and pump mechanical failure. We present a SCI patient, in whom bladder calculi acted as red herring for increased spasticity whereas the real cause was spontaneous extrusion of catheter from intrathecal space. A 44-year-old male sustained a fracture of C5/6 and incomplete tetraplegia at C-8 level. 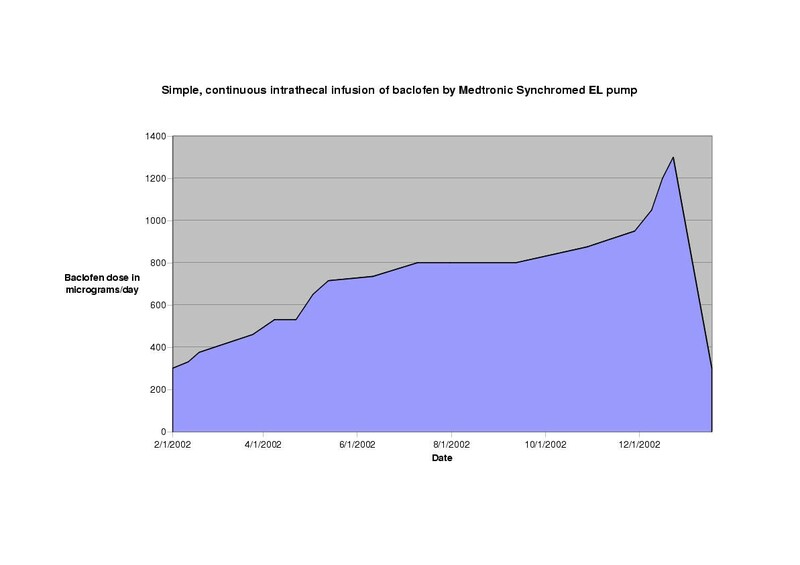 Medtronic Synchromed pump for intrathecal baclofen therapy was implanted 13 months later to control severe spasticity. The tip of catheter was placed at T-10 level. The initial dose of baclofen was 300 micrograms/day of baclofen, administered by a simple continuous infusion. During a nine-month period, he required increasing doses of baclofen (875 micrograms/day) to control spasticity. X-ray of abdomen showed multiple radio opaque shadows in the region of urinary bladder. No malfunction of the pump was detected. Therefore, increased spasticity was attributed to bladder stones. Electrohydraulic lithotripsy of bladder stones was carried out successfully. Even after removal of bladder stones, this patient required further increases in the dose of intrathecal baclofen (950, 1050, 1200 and then 1300 micrograms/day). Careful evaluation of pump-catheter system revealed that the catheter had extruded spontaneously and was lying in the paraspinal space at L-4, where the catheter had been anchored before it entered the subarachnoid space. A new catheter was passed into the subarachnoid space and the tip of catheter was located at T-8 level. The dose of intrathecal baclofen was decreased to 300 micrograms/day. Vesical calculi acted as red herring for resurgence of spasticity. The real cause for increased spasms was spontaneous extrusion of whole length of catheter from subarachnoid space. Repeated bending forwards and straightening of torso for pressure relief and during transfers from wheel chair probably contributed to spontaneous extrusion of catheter from spinal canal in this patient. Increased spasms in spinal cord injury (SCI) patients, whose spasticity was previously well controlled with intrathecal baclofen therapy, are due to (in order of frequency) drug tolerance, increased stimulus, low reservoir volume, catheter malfunction, disease progression, human error and pump mechanical failure. . 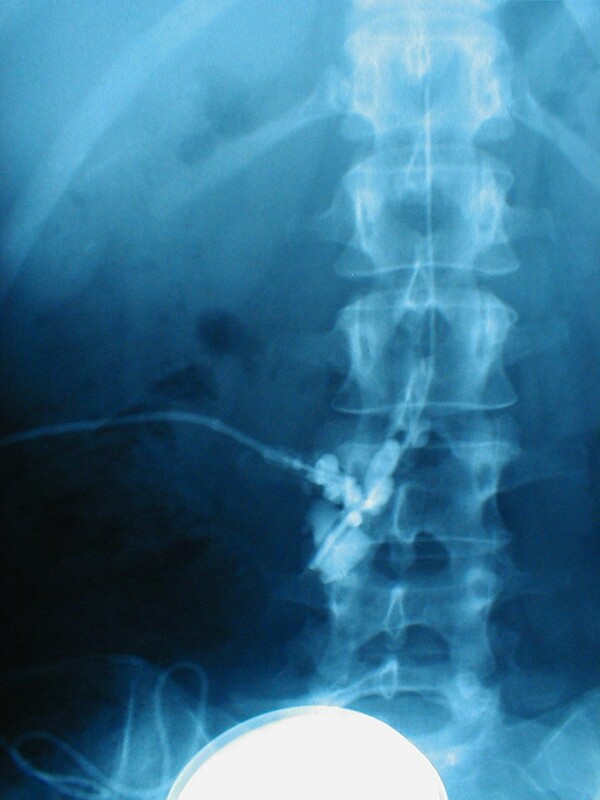 The frequency of complications after intrathecal baclofen therapy was 0.014 monthly, often due to catheter problems as noted in 79 patients with a mean observation period of 34 months. . Catheter failure was a common cause of intrathecal drug delivery problems and could be difficult to diagnose. [3, 4]. Catheter dislodgement can happen any time after implantation of pump and catheter-o-gram will confirm extravasation of contrast at the site of disconnection. (Figure 1). We present a spinal cord injury patient, in whom bladder calculi acted as red herring for resurgence of spasticity whereas the real cause for recurrence of spasms was spontaneous extrusion of catheter from intrathecal space, a complication which has not been described in medical literature (PubMed). Catheter-o-gram in a 49-year-old female patient with hereditary spastic paraparesis and implantation of Medtronic pump for intrathecal baclofen therapy: Discontinuity/fracture of the catheter adjacent to the body of L-3 on the right. A 44-year-old male sustained rupture of aorta, fracture of both tibiae, fracture of C5/6 in a traffic accident. He underwent thoracotomy and repair of transected aorta. Internal fixation and fusion of cervical spine was done at C-5/C-6 level. He had developed incomplete tetraplegia (ASIA scale D) at C-8 level. He was transferred to spinal injuries centre thirteen months later. By then he had developed severe spasticity of lower limbs. 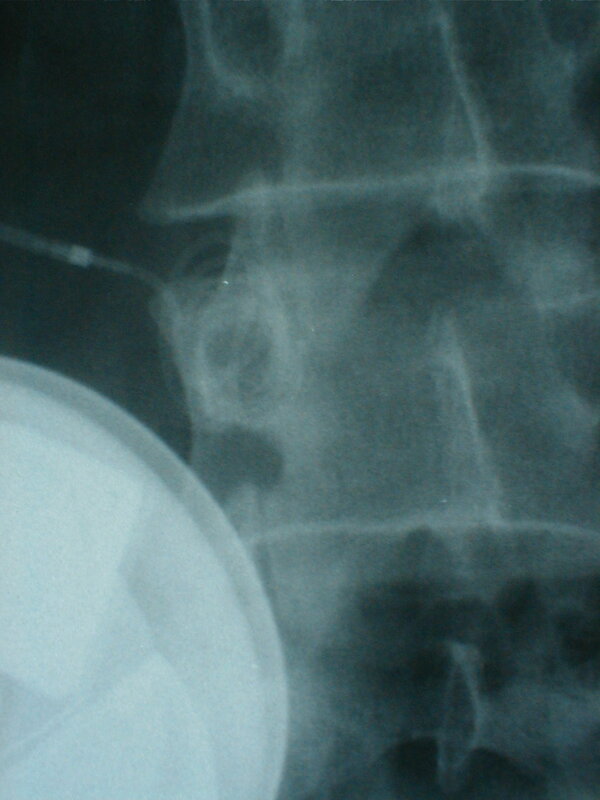 Implantation of Medtronic Synchromed EL 8626-18 pump for intrathecal baclofen therapy was carried out. The tip of catheter was placed at T-10 level in subarachnoid space. The initial dose of baclofen was 300 micrograms/day, administered by a simple continuous infusion. This patient required gradual increase in the dose of baclofen to control spasticity. 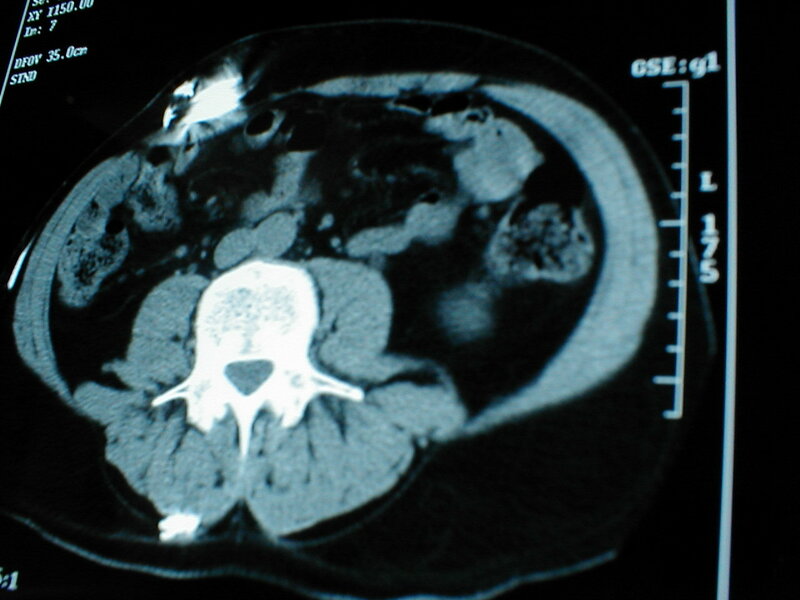 Intravenous urography, performed ten weeks later, showed both kidneys excreting contrast promptly. There was no hydronephrosis. The tip of catheter, for intrathecal administration of baclofen, was seen at T-10 level. (Figure 2). The presence of radio opaque shadows in the region of urinary bladder was not noticed. Five minutes film of intravenous urography, performed on day 487, shows good excretion of contrast by both kidneys. There is no hydronephrosis. The catheter is seen in the spinal canal. The tip of the catheter is located at T-10 level. There is no kink or dislodgement of catheter. Nine months after implantation of baclofen pump, X-ray of abdomen showed multiple radio opaque shadows in the region of urinary bladder. (Figure 3). Flexible cystoscopy confirmed the presence of vesical calculi. (Figure 4). As there was no pump stall and no discrepancy was observed between telemetric reading and the volume of fluid in the reservoir as checked by aspiration, increased spasticity was attributed to bladder stones. Electrohydraulic lithotripsy of bladder stones was carried out successfully. Even after removal of bladder stones, this patient required increasing dose of intrathecal baclofen. (Figure 5). When the dose of intrathecal baclofen was increased, the spasms were controlled satisfactorily albeit only for a short period. Prompt relief of spasticity, as observed by the patient when the dose of intrathecal baclofen was increased, led us to believe that the patient was perhaps developing tolerance to baclofen. In retrospect, we realise that we should have thoroughly examined the pump and the catheter system for any fault before increasing the dose of intrathecal baclofen. X-ray abdomen, taken on day 689, shows multiple radio opaque shadows in the region of urinary bladder. We failed to notice the absence of catheter in the spinal canal and coiling of catheter in paravertebral region at L-4 level. 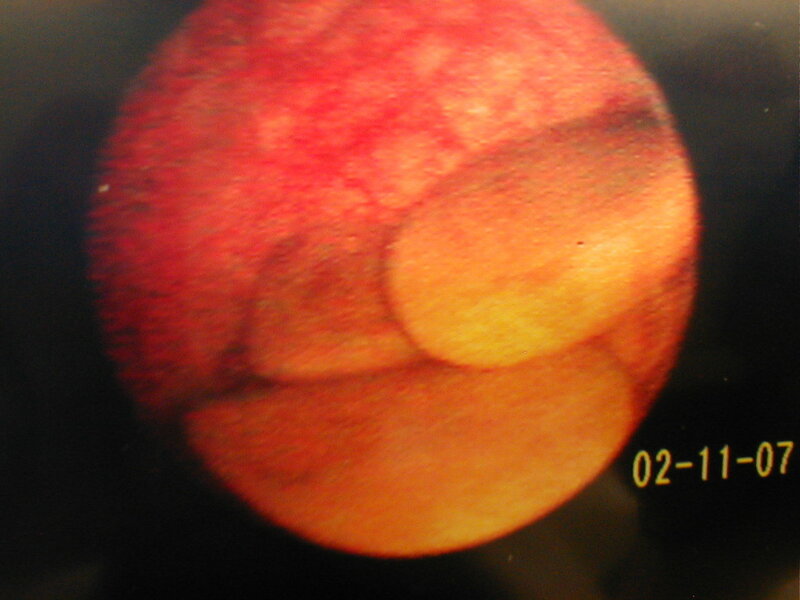 Flexible cystoscopy showed multiple calculi in the urinary bladder. Bladder stones acted as red herring for resurgence of spasticity whereas the true reason was spontaneous extrusion of catheter from the spinal canal. Chart shows dose of baclofen administered by simple, continuous infusion by Medtronic Synchromed pump. The patient required increasing dose of baclofen from 300 micrograms/day on day 412 to 1300 micrograms/day on day 738. X-ray of abdomen was taken seven weeks later to look for any dislodgement of catheter. Careful evaluation of pump-catheter system revealed that the catheter had extruded spontaneously from intrathecal space. The tip of catheter, which was placed at T-10 level, had extruded all the way down to paraspinal space at L-4, which was the site of entry of the catheter into subarachnoid space. (Figure 6). MRI scan showed no evidence of collection of cerebrospinal fluid in paravertebral soft tissue. CT scan showed the tip of catheter coiled superficially within the right longissimus lumborum muscle. (Figure 7). On exploration, the catheter was found coiled under the sheath of paraspinal muscle. A new catheter was passed into the subarachnoid space and the tip of catheter was located at T-8 level, which was confirmed by X-ray screening. Both tubes were connected and stabilised. The dose of intrathecal baclofen was decreased to 300 micrograms/day. 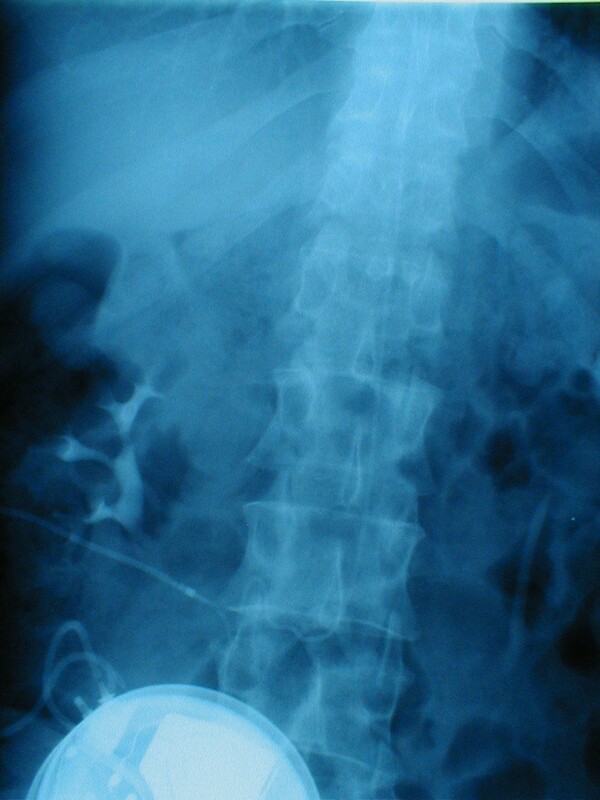 X-ray of abdomen, (close-up view of lumbar spine) which was taken on day 738 shows the catheter has come out of the spinal canal. The catheter is coiled in the paraspinal space at L-4 level. CT of lumbar spine performed on day 759, shows the tip of catheter coiled superficially within the right longissimus lumborum muscle. Baclofen pump is located in the anterior abdominal wall. Chronology of clinical events, dose of intrathecal baclofen, location of tip of catheter for delivery of baclofen and presence of bladder stones are summarised in Table 1. The catheter has come out of the spinal canal. The catheter is coiled in the paraspinal space at L-4 level. No CSF collection in paravertebral soft tissue. The tip of catheter is coiled superficially within right longissimus lumborum muscle. Exploration revealed the catheter lying under the sheath of paraspinal muscle. A new catheter was passed into the subarachnoid space and the tip of catheter was located at T-8 level, which was confirmed by X-ray screening. * These observations were made in retrospect after seeing the X-ray, which was taken on day 738. We report spontaneous extrusion of catheter from the spinal canal, which is a very unusual complication of intrathecal baclofen therapy. It is likely that repeated bending forwards and straightening of torso for pressure relief and during transfers from wheelchair, contributed to extrusion of catheter from the spinal canal in this patient. After extruding out of the spinal canal, the catheter got coiled in paravertebral space, where the catheter had been anchored firmly to intermuscular septum. Spontaneous extrusion of catheter from the spinal canal is unlikely to occur in profoundly disabled individuals, who do not actively move their trunk. For example, there may be individuals with advanced multiple sclerosis, who are confined to the chair and who do not have the ability to bend forwards and then straighten the torso for pressure relief or, perform unassisted transfers from the wheel chair to bed, toilet seat, or car. These patients are unlikely to develop extrusion of catheter from spinal canal if they undergo implantation of Medtronic pump for intrathecal baclofen therapy. Abrupt withdrawal of intrathecal baclofen therapy can result in a life-threatening syndrome (high fever, altered mental status, profound muscular rigidity that may sometimes progress to fatal rhabdomyolysis). The intrathecal baclofen withdrawal syndrome is clinically and pathophysiologically distinct from autonomic dysreflexia, malignant hyperthermia, and neuroleptic-malignant syndrome. . This patient did not develop intrathecal baclofen withdrawal syndrome at any stage. Probably, the catheter came out of thecal space very gradually over a period. Even when the catheter was extruded completely from thecal space, it is likely that a fibrous channel existed between the tip of the catheter and thecal space, which provided an entry path to the infused drug to reach thecal space. This would explain prompt relief of spasticity when the dose of intrathecal baclofen was increased. 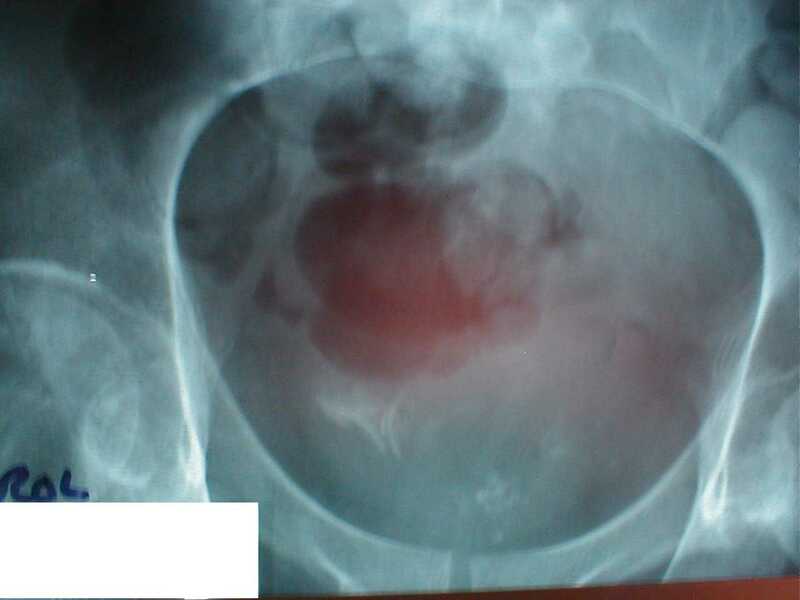 This case illustrates that catheter-pump malfunction should be excluded before ascribing resurgence of spasticity to drug tolerance, or other co-existing conditions such as bladder stones, particularly in SCI patients, whose spasms had been well controlled previously with intrathecal baclofen therapy. Vesical calculi acted as red herring for recurrence of spasms in this patient. In retrospect, we observed that vesical calculi were present even in the X-rays taken on day 487 when the patient had adequate control of spasticity and the pump was delivering baclofen satisfactorily with the tip of catheter located at T-10 level. (Figure 8). Had the X-ray taken on day 689 been available in an easily retrievable format for repeated viewing by different health professionals, it is likely that at least one of us would have noticed spontaneous extrusion of catheter from the spinal canal and we would have implemented corrective measures expeditiously. 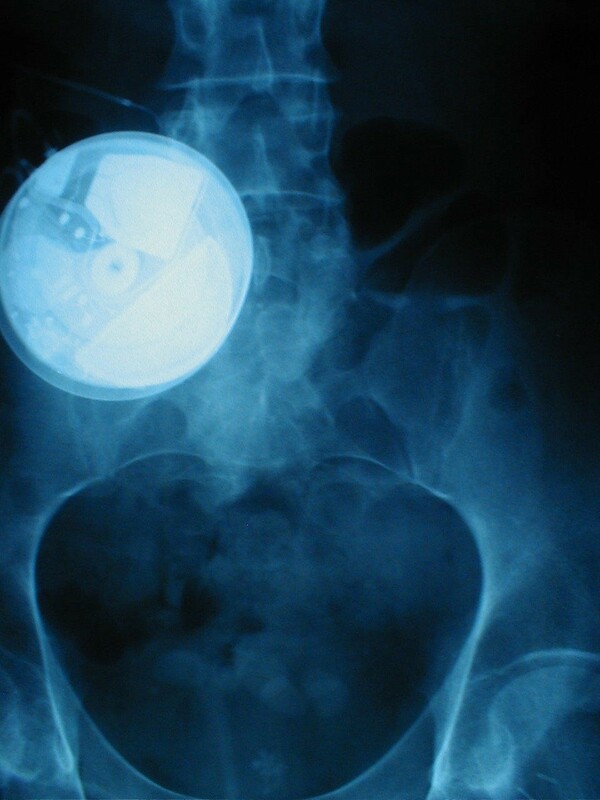 X-ray of pelvis taken on day 487 shows vesical calculi. When this X-ray was taken, the patient had adequate control of spasticity despite the presence of bladder stones because the pump was delivering baclofen satisfactorily with the tip of catheter located at T-10 level. It is possible that some physicians might have encountered similar mishap after implantation of baclofen pump, but have not published the adverse events for fear of recrimination. We favour voluntary reporting and dissemination of information on adverse events related to clinical procedures and medical implants [9–11]. Quite often, mishaps occur due to system errors and therefore, apportioning blame to individual health professionals should be avoided. A joint team approach by health professionals belonging to various medical disciplines, which is strengthened by frequent, informal and honest discussions of a patient's clinical condition, is likely to reduce delays in diagnosis and medical errors in spinal cord injury patients. We thank the patient for giving consent to publication of this case report. The authors are grateful to Professor David Rushton, Departments of Neurology and Rehabilitation, Kings College Hospital, Denmark Hill, London, United Kingdom, and Dr J.M. Meythaler, Department of Physical Medicine and Rehabilitation, Division of Neurological Surgery, University of Alabama at Birmingham School of Medicine, Birmingham, USA. Professor Rushton and Dr Meythaler made valuable comments to the original manuscript. A review of our submission by internationally renowned experts in the subject of intrathecal baclofen therapy helped the authors to revise the manuscript incorporating the useful suggestions made by Professor Rushton and Dr Meythaler. SV wrote the draft and performed lithotripsy of bladder stones; BMS and TO carried out implantation of baclofen pump; TO diagnosed extrusion of catheter from the spinal canal; all authors contributed to the final manuscript.